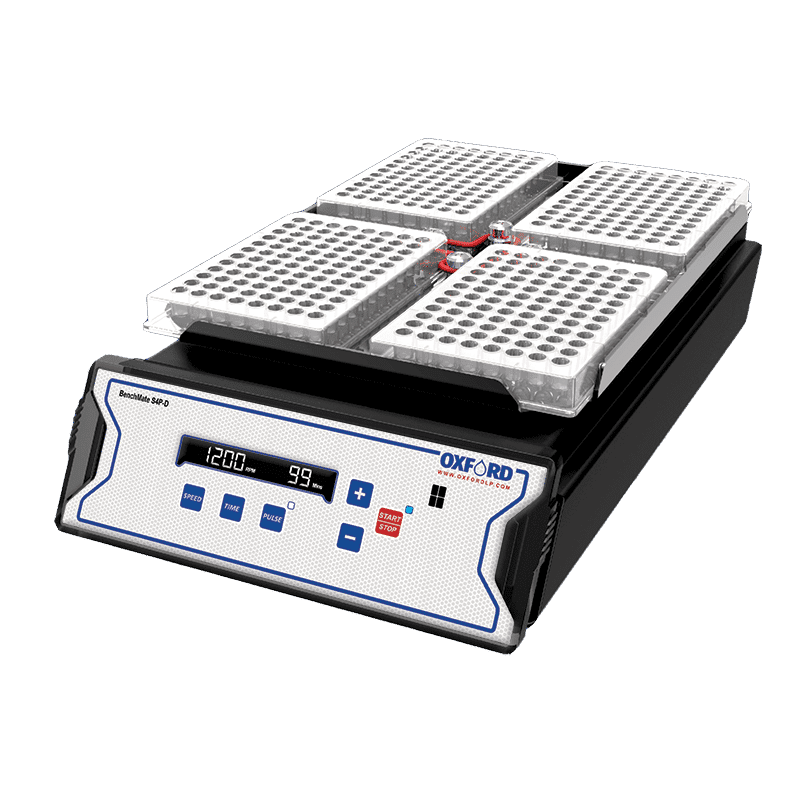 The Oxford Lab Products BenchMate S4P-D Four Plate Shaker has unique features that provide flexibility for users and scientists. With a programmable pulse mode for vigorous shaking, last run memory feature and compatibility with all standard skirted microplates, scientists will be able to accelerate the amount of work they can perform, improving efficiency and throughput. The BenchMate S4P-D Four Plate Shaker has a 3 mm orbital motion for thorough mixing of solutions in microplates. The programmable pulse mode for vigorous shaking alternates the rotating direction from clockwise to anticlockwise, giving the most thorough mixing. The BenchMate S4P-D Four Plate Shaker has an adjustable speed range from 200 to 1200 rpm. The central rubber O-ring of the plate shaker provides a firm grip for holding microplates securely in place. The BenchMate S4P-D Four Plate Shaker allows the user quick and easy access to all 4 plates for loading and unloading plates. The unit is compatible with all standard skirted microplates and is easy to clean and maintain. Looking for a regular platform orbital shaker? 3 mm orbital motion for thorough mixing of solutions in microplates. Adjustable speed range from 200 to 1200 rpm. Rubber O-ring provides a firm grip for holding plates. Easy access to all 4 plates for loading and unloading plates. Programmable pulse mode for vigorous shaking in alternating clockwise and anticlockwise directions.